If you are an airline delegate and interested in complimentary tickets, please do not hesitate to contact our marketing department (marketing@crossconsense.de). The Airline & Aerospace MRO & Operations IT Conference is the world’s only event to address the key issues relating to the development of IT and its key use for aircraft maintenance and flight operations. Aerologic outlines its recent ETL / ELB selection process; from selecting software and hardware platforms to flight deck connectivity. With the solution going live shortly, Aerologic outline how it is preparing crews for the change to paperless working along with expected results and benefits once operation commences. 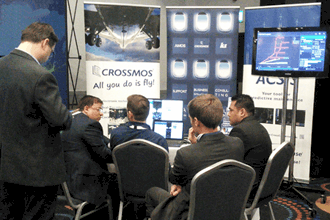 The presentation will be given by Nils Oehlmann, Project Manager of AeroLogic and Udo Stapf, CEO of CrossConsense. Your chance to quickly find out about all the major Electronic Logbook (ETL/ELB) solutions on the market. The CrossConsense team will provide a brief 7 minutes showcase of CROSSMOS® and you will also have the opportunity to ask questions concerning the solutions. 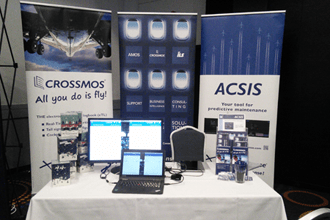 Get a software demonstration on CROSSMOS® and ACSIS and tell us more about the requirements you have in your company. Of course, you are also more than welcome if you want us to give you more information about our AMOS support, Business Intelligence solutions or about “Aircraft Fleet View” a mobile app to keep an eye on your fleet. https://www.crossconsense.com/wp-content/uploads/2018/03/Talk-to-the-experts_830x300_Blog.png 300 830 CrossConsense //www.crossconsense.com/wp-content/uploads/2016/02/CrossConsense_logo_RG.png CrossConsense2018-03-02 10:42:412018-05-17 09:04:34Talk to the experts! 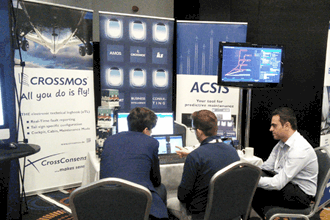 On the 11th Flight Operations Conference which took place in London beginning of this week Gerrit Jassnowski, Project Manager Paperless Maintenance, Lufthansa CityLine, presented a case study on how the Go-Live of CROSSMOS electronic logbook has been prepared. 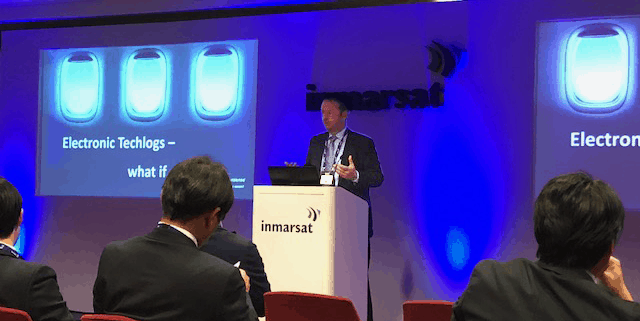 In front of an audience of more than 100 delegates of airlines from all over the world, Gerrit pointed out the expectations of cost savings because of implementing an ELB. He was supported by Udo Stapf, CEO of CrossConsense, who explained that CROSSMOS has been developed in close cooperation with several avionics specialists. If you are interested in the presentation, please contact marketing@crossconsense.de. 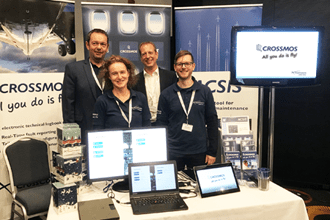 The CrossConsense conference team together with Gerrit Jassnowski (Lufthansa CityLine). Axel is explaining the pilot module of CROSSMOS. The empty stand at the beginning of the conference.